“Across California this week, more than 12,000 firefighters were battling several major wildfires. The Carr Fire, in Shasta County, has already become the state’s sixth most destructive blaze, leveling 1,067 homes as of Friday. Temperatures were reported to be 113 degrees, at least 13 degrees above average for the week, when the fire tore into the city of Redding, commented the San Francisco Chronicle in an August 3rd article from this year. Currently, two huge fires burn on either end of California leaving thousands displaced and approximately 700 unaccounted for. “The two monstrous blazes, which both ignited earlier this month, have claimed at least 87 lives while laying waste to a total area of nearly 400 square miles, according to the California Department of Forestry and Fire Protection. Officials said that the remains of at least 54 people have been positively identified so far,” ABC News reports. Scientists point to climate change as to be at the heart of the recent wildfire trends, “We’re not saying that climate change is literally causing the events to occur. What we can conclude with a great deal of confidence now is that climate change is making these events more extreme. And it’s not rocket science, you warm the atmosphere it’s going to hold more moisture, you get larger flooding events, you get more rainfall. You warm the planet, you’re going to get more frequent and intense heat waves,” stated atmospheric science professor Michael Mann on PBS NewsHour on August 6th of this year. Anthropogenic climate change accounted for ∼55% of observed increases in fuel aridity from 1979 to 2015 across western US forests, highlighting both anthropogenic climate change and natural climate variability as important contributors to increased wildfire potential in recent decades. We estimate that human-caused climate change contributed to an additional 4.2 million ha of forest fire area during 1984–2015, nearly doubling the forest fire area expected in its absence. 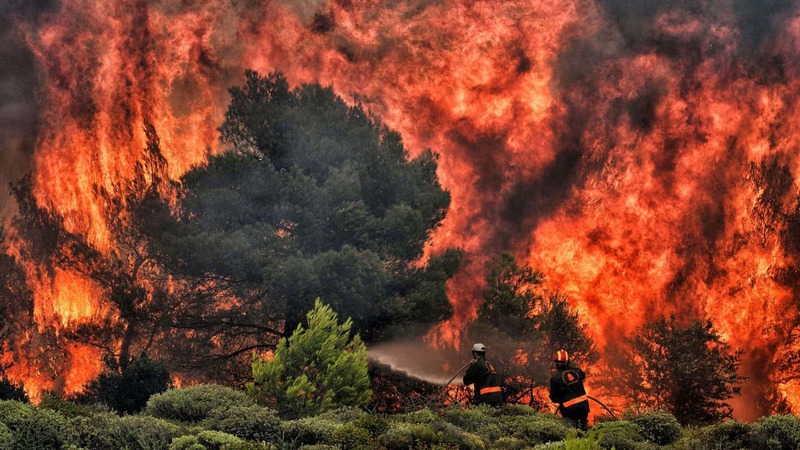 Natural climate variability will continue to alternate between modulating and compounding anthropogenic increases in fuel aridity, but anthropogenic climate change has emerged as a driver of increased forest fire activity and should continue to do so while fuels are not limiting. Very large fires (VLFs) have important implications for communities, ecosystems, air quality and fire suppression expenditures. VLFs over the contiguous US have been strongly linked with meteorological and climatological variability. Building on prior modelling [sic] of VLFs (>5000 ha), an ensemble of 17 global climate models were statistically downscaled over the US for climate experiments covering the historic and mid-21st-century periods to estimate potential changes in VLF occurrence arising from anthropogenic climate change. Increased VLF potential was projected across most historically fire-prone regions, with the largest absolute increase in the intermountain West and Northern California. Warmer and drier conditions particularly facilitate fire, drought and insect disturbances, while warmer and wetter conditions increase disturbances from wind and pathogens. Widespread interactions between agents are likely to amplify disturbances, while indirect climate effects such as vegetation changes can dampen long-term disturbance sensitivities to climate. Future changes in disturbance are likely to be most pronounced in coniferous forests and the boreal biome. We conclude that both ecosystems and society should be prepared for an increasingly disturbed future of forests.